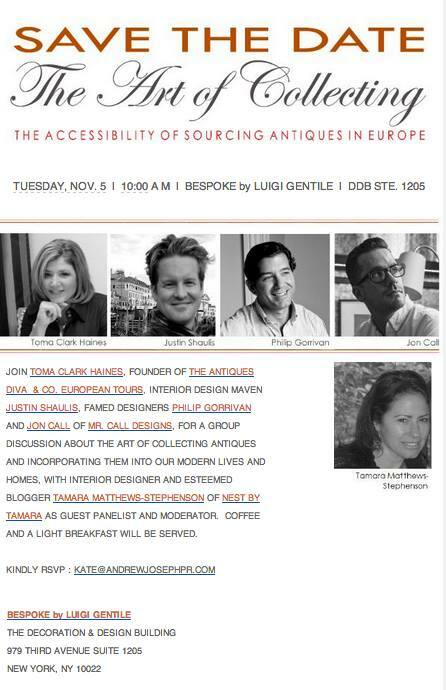 Last week I was delighted to speak in NYC on a panel on The Accessibility of Sourcing Antiques in Europe at the Decoration and Design Building. In this discussion intended for an interior designer audience we answered a slew of questions from where to go, to what to buy, to how much it actually costs and – most importantly – how to get it home once you buy it, sharing insider knowledge and secret hints and tips. 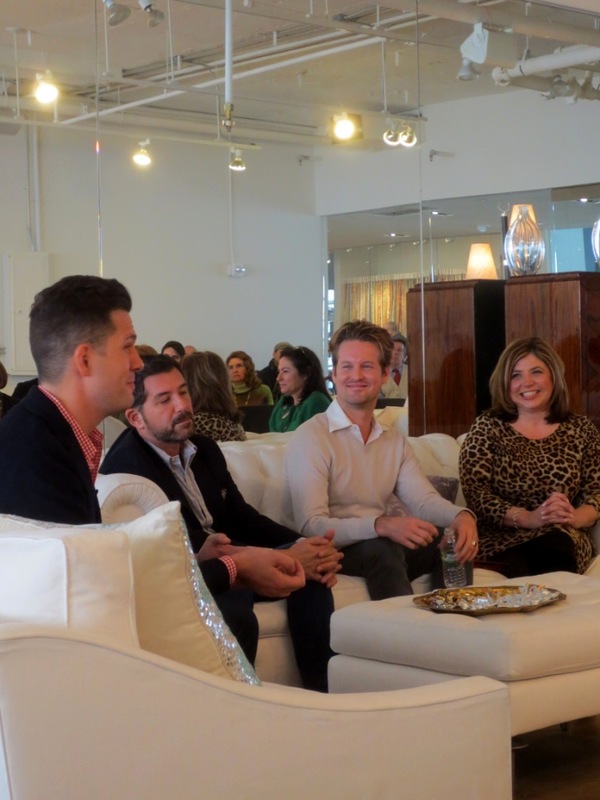 Held in the D&D Building’s newest and hottest showroom, our host was the Bespoke by Luigi Gentile Showroom which specializes in custom, fine, hand-crafted furniture exclusively for the interior design community. 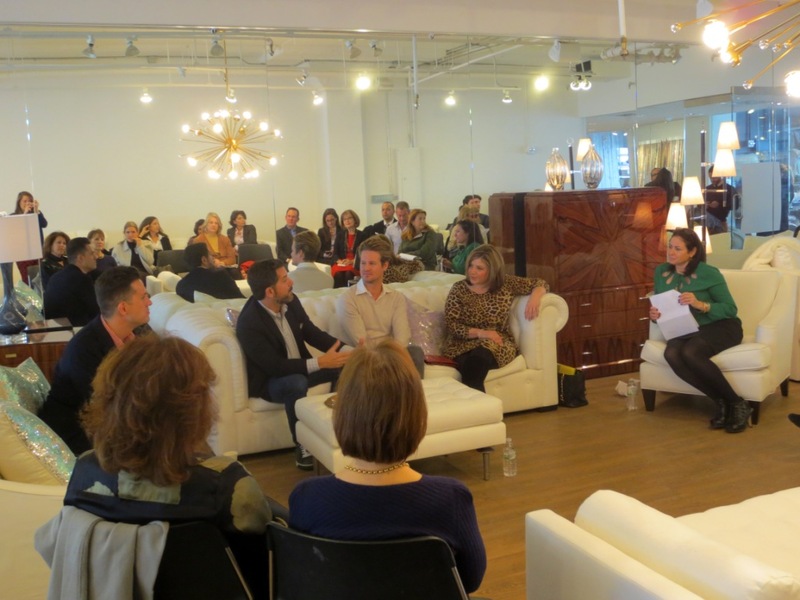 During our Panel Discussion my cohorts and I were able to linger on perhaps the most comfortably chic, custom-made sofa I’ve ever sat on… and whilst discussing European antiques at one point I found my mind pondering Bespoke’s sectionals. What I love about this showroom is they make custom as easy as buying one off the showroom floor. They assist in all phases of the specifying process, from the initial conceptual selection of the basic style to the direction of the fabric application. The event was moderated by the effervescent Tamara Matthews Stephenson, the blogess behind “Nest by Tamara” blog. I first met Tamara when on #BlogTourNYC several years ago and was immediately charmed by her wit, her savvy style and chic design sense combined with fabulous personality. Needless to say I’m not the only one who has been charmed by here – her blog has been voted #1 out of the Top 100 Design Blogs by Modenus. She is a mover and shaker in the design world – Dot & Bo listed Tamara as one of the TOP 50 Home Influencers inspiring us in how we live today. She started the event by sharing how her own father worked in antiques and telling stories of growing up going to auctions… should I ever decide to start Antiques Diva New York, Tamara would be the first person I’d call to help me leap the Atlantic. 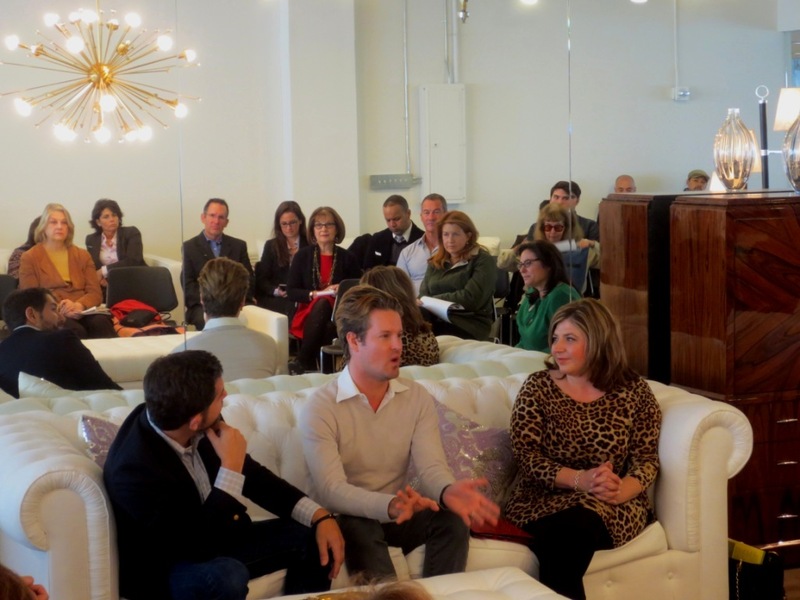 In addition to me participating on the panel several famed interior designers also shared their stories of buying abroad. 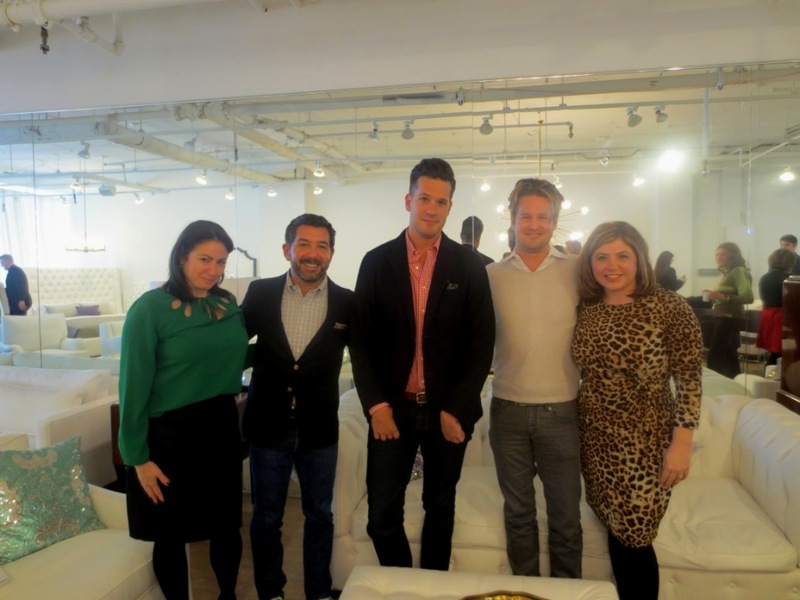 I was joined by interior design maven Justin Shaulis, Jon Call of Mr Call Designs and Philip Gorrivan who divides his time between NYC and London and whose work has graced some of the top shelter publications from Elle Décor to House Beautiful. Philip Gorrivan owns the eponymously named multi-disciplinary design firm incorporating interior design, architecture and product design. The firm brings its wide expertise and tailored modern taste to high-end private residences, commercial properties, yachts and hospitality projects in the United States and abroad; creating spaces, furniture and fabrics that are at once fresh and new, yet elegant and classic. His carefully edited aesthetic stems from his passion and study of the decorative arts and the history of architecture juxtaposed with contemporary art and new techniques and finishes. Both Justin Shaulis and Jon Call of Mr Call Designs have been on recent Antiques Diva tours and both say the accessibility of sourcing in Europe has changed the way they as designers will do their business in the future. 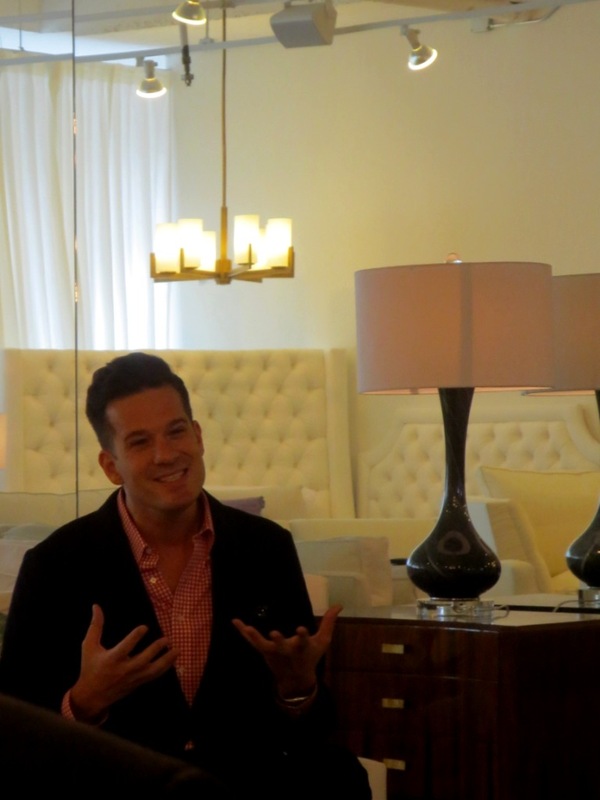 Justin Shaulis, who is quite possibly the most charming lad in Manhattan, has over 15 years of experience in architecture and interior design, working with some notable names in the industry. If his name sounds familiar it might be because you’ve seen him on HGTV – Justin starred as the Design Host for a philanthropic-based series called “Home Rules” where he and Lifecoach, Fran Harris, worked on changing the life of a family inside and out in one week. Additionally he has worked with leading furniture manufacturers to create industry showcases, provided architectural and design services for financial firms and large-scale offices in major corporate spaces while maintaining a boutique-styled approach. His experience with special projects, including development of houses, homes, estates, museums, showrooms and offices, has allowed Shaulis to make major contributions to a variety of different design outcomes. Shaulis’ perspective on design is drawn from diversity: a blue-collar upbringing, a Big 10 University education and his home in New York City. In 2002, Shaulis founded Justin Shaulis, Inc. creating a studio environment and utilizing holistic design methodologies based on context and quality of life in realizing Emotive Design. Meanwhile designer Jon Call is simply dashing and adoreable and everytime I turn around I keep seeing his name popping up in the press. He studied architecture in Seattle before moving to New York to work for Diamond Baratta, where he was immersed in their world of vivid color, custom furniture, and storied tradition. After that, he worked for Shawn Henderson, another young designer, before striking out on his own in 2010. The name of the firm, a somewhat cheeky reference to the days when designers were known by Mr. or Mrs., embodies Call’s spirit: he winks, rather than nods, at the past. Clients say he is smart, professional, energetic and that he listens well but will be firm in “preventing you from making a bad choice.” Those looking for a rubber stamper with access to the D&D or a dusty Park Avenue institution are advised to keep looking. Those in search of a fun, fresh designer with classic taste would do well to pay a visit to Mr. Call. It was such an absolute pleasure to be able share insight with the NYC Design Community into the Accessibility of Sourcing in Europe. Having panel members with profiles such as these greats of design made the event even more special. If you’re bummed to have missed the event in NYC – don’t worry – we’re taking this gig on the road. Stay tuned for this Panel Series to come to a city near you. Next up: Chicago on Tuesday! « The Canny Collector and a shaken Martini…life is good! of these responses appear as if they are coming from brain dead folks? Excellent blog on home design and antiques great blog post on this designer and his unique mid century mod design style. I love using antique pieces and creating home spaces that do not look like it was meant to be placed together but rather put together over time. I look forward to following and reading your future blog posts.